This is something very new to me. I came across this website from one of my co-blogger and also in a magazine. But I was not sure whether this will taste good or not. So I tried this dosai yesterday using small cups for measurement. Here is the recipe I followed. First grind the oats into very fine powder. Keep it aside. Now take the buttermilk add oats powder, besan flour, sooji and salt and mix it well. Keep it aside for half an hour. In the mean time, preheat a drop of oil, splutter mustard seeds, when its done add cashews, onion, asafoetida powder and green chillies and fry it till it becomes golden brown. 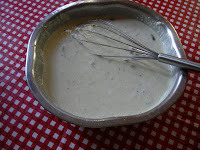 Now add curry leaves and coriander leaves to it and saute' for a moment and pour it on top of the batter. Mix it well. Pre heat a dosa skillet, pour a laddle full of batter and spread it into a circle, pour a teaspoon of oil and let it cook under low flame (because it becomes very dark). When it is done flip it over and pour the remaining oil and cook it. Serve it hot with some chutney or sambar. This tastes really good and it tastes more like rava dosa. Looks like you are hooked onto Oats dosai as well. Nice. 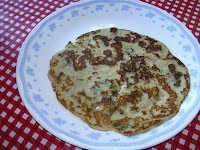 I just posted the recipe for crispy Oats dosai a couple of days back. Yours is different and good as well. Nice recipe looks gud and healthy..gud one dear..
simple n healthy....nice recipe...this is my first here... u have a lovely space. Thanks Vidhya for adding me to your blogroll. I appreciate it. Hi dear, i make this too. But yet to take pictures :-). I skip the besan though. I've a little something for you in my blog. Looks very healthy and good. Will try it. I have added u in my blogroll. very nice... just a suggestion.. instead of besan if you are a south indian you can add Rice flour also.